The National Academy of Statistics, Accounting and Auditing is a higher educational institution of the fourth accreditation level with a history of almost 30 years. As an independent higher educational institution of Ukraine the Academy has existed since 1992. Up to this point it was Ukrainian branch of Moscow Interdisciplinary Institute of Advanced Training of Professional Accounting and Statistics of the State Statistics Committee of USSR where the specialists in accounting-economics of the former Soviet Union studied: from Baltics to Kamchatka. With Ukraine proclaiming its independence the Educational Institution has changed its status and concept of educational activities towards training and retraining of specialists in economic specializations. From 1992 to 2000 the Institution was called Institute of Training Specialists in Statistics and Market, while from 2000 to 2003 – Institute of Statistics, Accounting and Audit of The State Statistics Committee of Ukraine. By the order of the Cabinet of Ministers of Ukraine dated 24th of February 2003 #89-r – the Educational Institution was renamed to State Academy of Statistics, Accounting and Audit of The State Statistics Committee of Ukraine. By the decree of the President of Ukraine Yushchenko V. dated 13th of January 2010 № 18/2010 the Educational Institution received the status of a National Higher Educational Institution with an official name National Academy of Statistics, Accounting and Auditing. Establishment of the National Center for Accounting and Audit at the outset of formation of the national audit by the Order of the Cabinet of Ministers of Ukraine dated 6th of December 1993 № 1042-r. The Educational Institution is entrusted with a task of training, retraining and professional development of accountants and auditors, development and publishing of workbooks and study guides in accounting, analysis, auditing and auditing activities. Licensing and accreditation by the Ministry of Education and Science of Ukraine of the educational activities of the Academy in the following specializations: “Accounting and Auditing”, “Economic Statistics”, “Finance”, “Economic Cybernetics”, “Banking”, “Management of Foreign Economic Activities”. Establishment of a network of branches has occurred in Bila Tserkva, Lytsk, Mykolayiv, Poltava, Rivne, Sumy, Kherson, Cherkasy, Chernivtsi, Chernigiv. Inclusion of the Educational Institution in accordance with the resolution of the Presidium of HAC of Ukraine into the registry of leading institutions for thesis expertise in specialization 08.03.01 – Statistics and in specializations 08.06.04 – Business Accounting, Analysis and Auditing. Granting of the right to the Academic Council of the Academy to confer academic ranks of Professor and Associate Professor is performed in accordance with the resolution of the Ministry of Education and Science of Ukraine. Demographics, Economics of Work, Social Economics and Politics. Introduction of the own periodic specialized publication – “Scientific Bulletin of the State Academy of Statistics, Accounting and Auditing” is conducted. Establishment in accordance with the resolution of the Presidium of HAC of Ukraine of a Specialized Academic Council with the right to review and defend theses for getting academic degree of Doctor of Philosophy (Ph.D.) in Economics in specializations: 08.00.10 – Statistics; 08.00.09 – Business Accounting, Analysis and Audit (by types of economic activities). Gaining in accordance with the decree of the President of Ukraine Yushchenko Y. №10/2010 dated 13.01.2010 the status of National Academy. The Academy together with the State Statistics Committee of Ukraine, the Research Institute of Statistics, National Academy for Public Administration under the President of Ukraine is a co-founder of international magazine “Statistics of Ukraine”, which is published quarterly since 1998. The Academy has also founded preparation and publishing of the own periodic specialized publications: quarterly “Academic Bulletin of the National Academy of Statistics, Accounting and Auditing”, scientific digest “Applied Statistics: Problems of Theory and Practice”, scientific digest “Business Accounting, Analysis and Auditing: Problems of Theory, Methodology and Organization”. Famous Ukrainian scientists work in the Academy, including doctor of science in state governance, corresponding member of the National Academy of Science of Ukraine, Professor Osaulenko O.G., doctors of science, professors. Kadievskyy V.A,. Motsnyy F.V, Nadolnyy I.F., Parfentseva N.O,. Shevchuk V.O,. Puzanov I.I,. Korinko M.D,. Malyuga N.M., Momotyuk L.E., Kisterskyy L.L, Telovata M.T., Popova V.V., Bondaruk T.G,. Redko O.Y. and others. The Academy has established fruitful relationships with a range of foreign higher educational institutions and foundations, range of academic bodies. This enables to raise the level of professional skills of Academy’s faculty, to arrange for foreign internships for the best students. “Management” (full-time and part-time studies). “Organization of Servicing in Transport”. Second higher education is provided (“Applied Statistics”, “Accounting and Auditing”). The duration of studies – from 1,5 to 5 years depending on a basic education and form of education. 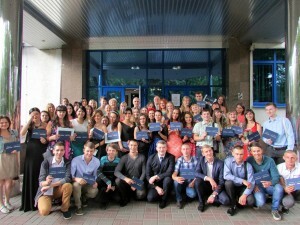 Secondary school graduates with the full-time form of education receive education in the abovementioned specializations within 5 years, graduates of technical secondary schools and colleges – within 4 years, persons with higher education receive second higher education by part-time form of education within 1,5 years. Persons with diplomas of junior specialist are admitted to the third course of the Academy, if their specialization matches the one they intend to obtain in the Academy, and to the second course – in all other instances. Education is paid-for. The cost of education is lower than in the other higher educational institutions in Kiev. In the Academy there are free of charge preparatory courses for applicants. Doctoral and post-graduate studies provide education for post-graduate and doctoral students on contractual basis (by financial means of juridical or physical entities), on a part-time or full time basis in the following specializations: 08.00.10 – Statistics, 08.00.09 – Business Accounting, Analysis and Audit 08.00.07 – Demographics, Economics of Work, Social Economics and Politics. Entrants to doctoral and post-graduate studies pass entrance exams in their specialization, philosophy and foreign language to an extent of programs in higher educational institutions of III-IV accreditation levels. In accordance with the decree of the Presidium of the Higher Attestation Commission of Ukraine № 1-06/7 dated 30th of June 2004, there was a Specialized Academic Council D.26.870.01 established in the Academy of Statistics, Accounting and Audit with the right to review and organize defense of theses for getting academic degree of Doctor and Ph.D. in Economics in specializations: 08.00.10 – Statistics; 08.00.09 – Business Accounting, Analysis and Audit. Upon graduation a diploma of state standard is awarded. To support education of highly qualified specialists there is a necessary material and technical basis created in the Academy, incl. modern library, gyms complex, computer center, which premises are equipped with modern computing machinery, connected to the Internet, lingaphone laboratory, medical center, own dormitory, etc. By all criteria this equipment meets standards and norms of the Ministry of Education and Science of Ukraine. The Academy is a Higher Educational Institution, which belongs to the system of State Statistics of Ukraine. The Academy prepares highly qualified specialists for many state institutions and organizations, besides Academy’s graduates are ever more often offered employment in various enterprises and organizations of business sector.